New research shows that this total solar eclipse, captured here by NRK News in Norway's Svalbard archipelago in the Arctic Ocean in March of 2015, caused a measurable temperature difference while blotting out the sun over the archipelago. A solar eclipse in March 2015 produced a slight but noticeable drop in temperature in the Norwegian archipelago of Svalbard, a new paper shows — and the team's getting ready to observe another eclipse tomorrow. A thermometer hanging from a camera tripod recording the eclipse observed the temperature drop 15 degrees Fahrenheit, from 8 F to -7 F (-13 to -22 degrees Celsius). Automatic temperature and pressure sensors showed only slight effects, however. The paper was part of a special theme issue concerning the 2015 eclipse, which was partially visible from the United Kingdom. 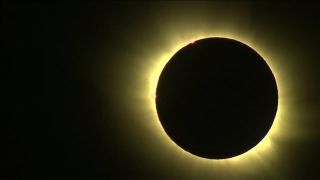 Lead author Jay Pasachoff, an astronomy professor at Williams College in Massachusetts, plans to follow up the research by observing two more solar eclipses in the next year, the college's representatives said in a statement. Tomorrow (Sept. 1), Pasachoff's team will be at the Isle de la Réunion in the Indian Ocean east of Madagascar to observe an annular solar eclipse, which occurs when the moon blocks all but a thin circular ring of the sun. This will be Pasachoff's 64th solar eclipse and 16th annular solar eclipse. Next year, he will visit Salem, Oregon, where his team will attempt to observe a total solar eclipse on Aug. 21, 2017.